Click the Menu Item Type Select button and then click the Search Form or Search Results link under Search. Used to create a 'Search Form' page for users to search site's content. Additional, used to control output look of search results or 'can' the results of a search with a menu link for preset search term or terms. Use Search Areas. (Global/No/Yes) Check boxes for search area types: Articles, Categories, Contacts, Newsfeeds, or Weblinks. Search for. (All Words/Any Words/Exact Phrase) Set the type of search. Search for All Words, Any Words or Exact Phrase. Results ordering. Set the search results ordering. Newest. Show newest item first. Oldest. Show oldest item first. Popularity. Show by popularity of item, number of page hits. Alphabetical. Show in alphabetical order. Category. Show in category order. 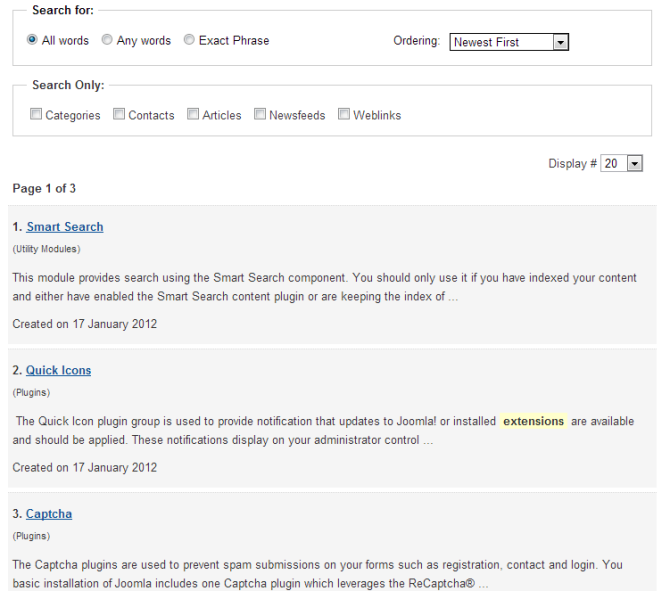 This screen shows the static search filters currently available for use in Smart Search. This screen allows you to create a new search filter or amend an existing one. This Module displays a Search entry field where the user can type in a phrase and press Enter to search the web site. This Module displays a Smart Search entry field where the user can type in a phrase and press Enter to search the web site. This page was last modified on 20 February 2013, at 17:16.